(Colorado Springs, Colo.) – For more than 25 years, athletes competing in fencing events for individuals with disabilities throughout the United States have used the moniker of “wheelchair fencing.” While many of the pioneers in the sport were individuals who utilized wheelchairs on a day-to-day basis, as the sport continues to grow and evolve, fencers with a wide range of disabilities, including those with amputations, cerebral palsy, traumatic brain injuries, etc., have been introduced to the sport. 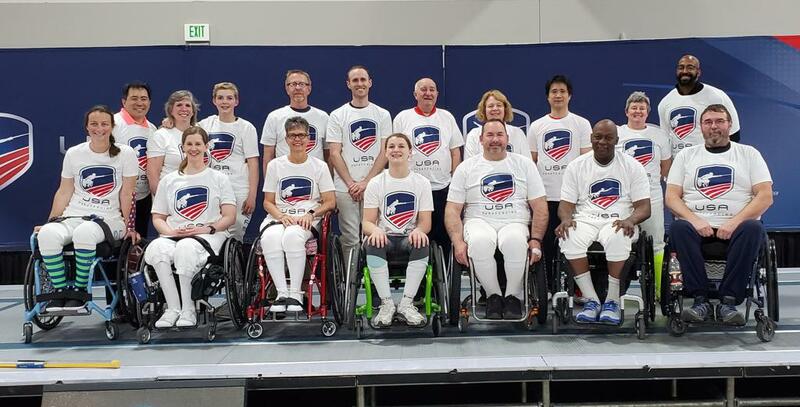 After discussion with athletes, coaches and the Paralympic Development Resource Team, USA Fencing will be introducing the term parafencing over the course of the coming year in order to be inclusive of athletes with a variety of disabilities. This move is in line with terminology used by other sports within the Paralympic movement, including swimming, triathlon, rowing, track and field, etc. In conjunction with the utilization of the new terminology, USA Fencing is releasing a new mark for athletes competing in the sport of parafencing. The new logo for USA Parafencing was created by CMD – the agency that spearheaded USA Fencing’s organizational rebranding efforts in 2015. The USA Parafencing logo utilizes key aspects of the USA Fencing logo, including the shield and the three red bars that represent the three weapons of fencing – epee, foil and saber. The red, white and blue color palette remains the same as that used in the USA Fencing logo. The key distinction is the utilization of a parafencing athlete within the center of the shield. The logo was designed by CMD with input from the Paralympic Development Resource Team and the Marketing & Communications Resource Team. Unveiled in Salt Lake City on Friday at the National Championships and April NAC, fencing fans can expect to see the new parafencing marks on signage, apparel, merchandise and at events throughout 2019 as athletes continue on their qualification path to the 2020 Tokyo Paralympic Games. For more information on parafencing, visit www.usafencing.org/parafencing.